Is Memoir Always About Someone’s Deep and Unconscious Pain? 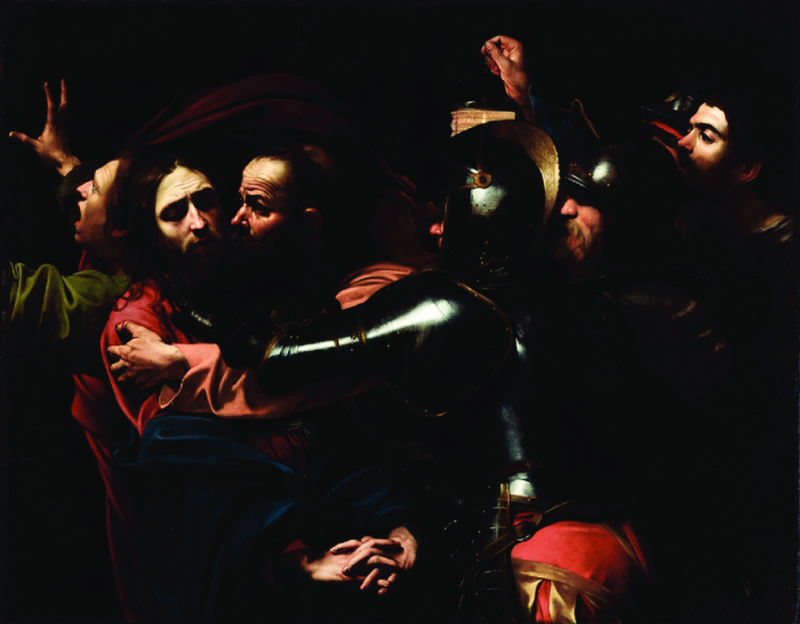 The moment of trouble (Caravaggio’s The Taking of Christ). No. No. And no. But some people do come to the process of writing to sort out life experience, and most people are less likely to do that when things are soaring than when they have hit a bump. Hence, the common revelations in a lot of personal writing of deep and unconscious pain. Memoir is not, however, therapy—although there are plenty of writers who segue from journaling for self-understanding into the belief that they are writing memoir. And while it’s true that the insights and feelings recorded in such pages might contain a seed of a memoir, it is most likely that the writing is not memoir. All good memoir contains authentic truths about private experience and emotion. That’s why we read it—for the secrets. In these secrets, we find keys to our own locked doors. But all good memoir also does more than just reveal inner turmoil. Whether you are writing about traveling the globe, healing a broken heart, or planting a garden of heirloom tomatoes and the joy associated with that loving task, you can build a memoir around this central activity and the emotions, insights, and personal questioning the activity elicits in you. But you can also teach the reader new information and new ways to see the world through your experience. Anything you have done and felt passionately can be translated into prose with beauty of language and depth of meaning, but those memories will not necessarily be compelling memoir for today’s marketplace if there isn’t some trouble that develops in the tale, and this is where we encounter the bugaboo of deep and unconscious pain that can give memoir a bad reputation as the dumping ground for amorphous whining. What I mean by trouble is conflict. Trouble is the heart of story. Without conflict there is no story. Story is the action of characters caught up in conflict and the process of overcoming that conflict. In the current market, memoir is expected to present problems and show the narrator coming to terms with those problems. Quiet stories, as agents and editors will call them, about planting that garden of heirloom tomatoes and keeping rare species alive can be quite interesting, but unless such a narrative includes some trouble—an unexpected blight that threatens the plants and the livelihood of the grower—the story could be so quiet as to be unmarketable as a memoir. The fact is: most contemporary readers are drawn to stories where there are problems and solutions, the more flamboyant, the more appealing for some. No matter the genre, it is drama—trouble, and what people do with that trouble—that piques readers’ interest and keeps them turning pages, and so with memoir we have the revelation of private experiences full of trouble in the pursuit of transformation. If well written, this process of transforming personal trouble can translate into a universal experience for readers. Witness books like Wild, or Eat, Pray, Love, or farther back: Angela’s Ashes and The Liars’ Club. With memoir books like these, readers experience a convergence; they attain self-understanding through the personal revelations of the writer and that writer’s coming to terms—yes, with often deeply held unconscious pain. That is why outsiders can be heard lamenting the form: Sheesh! Is that all it’s about—deep and unconscious pain? Well, no . . . but yes. Perhaps it would be more apt to say: Memoir is always about someone’s trouble and what they did with it.